I love to cook. I love to cook in my RV galley, a lot. Any time I get the opportunity to try out a new recipe that's really different from what I normally cook is a huge bonus. This time, I was introduced to a "new" vegetable...the Chinese Leek. It's kind of like a scallion, with a stronger, sweeter and nuttier flavor. Really tasty. Last week while traveling, I went past a fresh fish shop that was just offloading a shipment of shrimp, so naturally I bought a couple of pounds. This recipe is REALLY easy to prepare AND you can cook everything in the same skillet! BONUS! Less cleanup is Always great for me!! Begin by cleaning the shrimp. This is the biggest prep job for the recipe. I prefer to "De-Vein" them before cooking... It's not really a "vein," but the shrimp's alimentary track. You know, it's digestive track, from one end to the other. Most assuredly NOT, "Good Eats!" After they are prepped and washed. Squeeze them in a paper towel to dry and put them aside for the moment. Next, wash the Chinese Leeks, and cut the green parts into one inch pieces. Take some fresh ginger root, wash, and peel a section. (You could use powdered ginger as well.) Then cut into matchstick thin slices. Cut one regular scallion into small sections and put that aside. 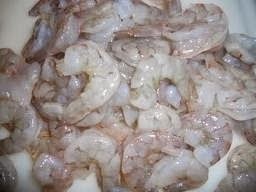 Cut the shrimp into 3/4 inch pieces. Put some vegetable oil in a skillet and preheat. Reduce to medium heat and add the ginger and scallion. Cook for 45 seconds while stirring. This will smell absolutely WONDERFUL. 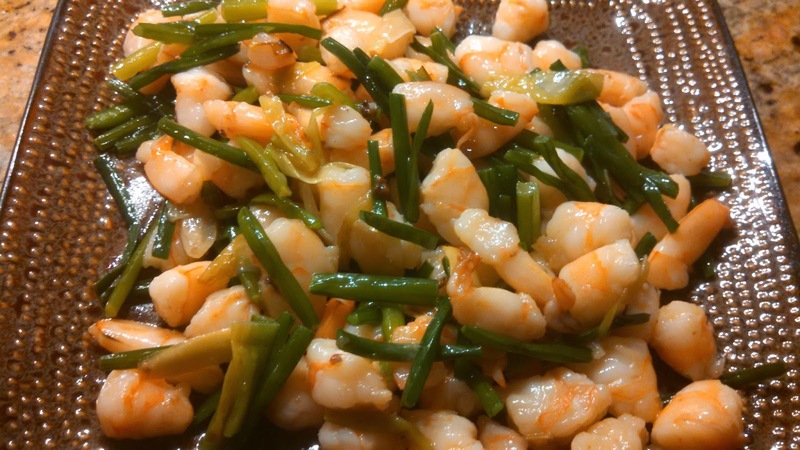 Increase the heat to medium-high and add the shrimp in one section of the pan and mix with scallion and ginger until the shrimp becomes white. NOT cooked through, yet! Add the Chinese Leeks to the pan and mix thoroughly until the shrimp is just about cooked and the Leek leaves are wilted. The leaves should still be vibrant green! Remove from heat just BEFORE the shrimp is completely cooked. They will finish cooking on the plate. Optionally, you can add a bit of sesame oil just before you transfer to the plate for some extra flavor! That's it! Sounds complicated when written, but REALLY isn't. You will be surprised at just how delicious something this simple can be!! With modifications you can make many dishes with this technique and a variety of fresh ingredients. I'm already looking at using the Chinese Leeks in Soup! Delicious!